Shelby Miller had his fastball dialed in Tuesday night in Milwaukee. MILWAUKEE — Cardinals starters are feeling right at home on the mound at Miller Park. A night after Lance Lynn shutout the Brewers, fellow hard-throwing right-hander Shelby Miller followed Tuesday by striking out seven and allowing three hits over six innings to lead St. Louis to a 6-1 win. Mark Ellis had two RBIs in his return from the disabled list, while Matt Holliday and Jhonny Peralta each hit solo shots in the ninth for the Cardinals, who handed Milwaukee its second straight loss following a nine-game winning streak. Miller (1-2) routinely fired fastballs clocked into the mid-90s past hitters before turning the game over to the bullpen in the seventh. He bounced back after starting the year with two losses and a 6.35 ERA in his first two starts. "That looks more like Shelby. 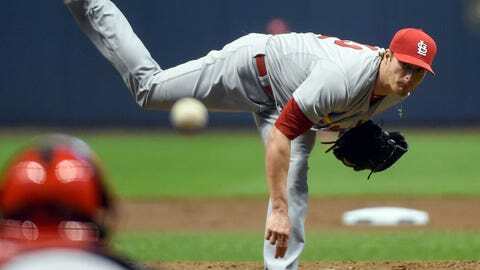 The velocity was there," manager Mike Matheny said. Only Aramis Ramirez managed to break through off Miller hitting a solo homer in the fourth. "Sneaky fast. He’s throwing. It’s not only sneaky … he spots his fastball really well on the outside corner, inside," Ramirez said. "He’s going to come right at you, so we’ve got to make some adjustments." They didn’t make enough of them Tuesday. The Brewers have just one run and six hits over the first two games of the three-game set with their NL Central rival. Marco Estrada (1-1) took the loss after allowing three runs over six innings. The right-hander, who was off to a good start with a 2.31 ERA entering Tuesday, had a little uncharacteristic trouble with his command. He hit a batter in the second, then issued a walk in the third to Matt Carpenter that set up Allen Craig’s RBI double. Estrada also threw a wild pitch in the fourth, but did allow just five hits. "When they battle like that and keep the team in the ballgame, that’s their job. They’re not going to feel good every time out," manager Ron Roenicke said. It would have been more than adequate pitching during the Brewers’ long winning streak. But that was before Milwaukee had to face the aces from St. Louis. Lynn was in control Monday night after striking out 11 over seven innings. Miller was just as effective. He got Jean Segura to ground out to second and caught Ryan Braun looking on a 94 mph fastball to start the fourth. The only mistake was a fastball down the middle of the plate that Ramirez turned on for his second homer and team-best 12th RBI. Miller recovered nicely to end the fourth by getting Jonathan Lucroy to hit a one-hopper to first. Miller, who improved to 4-0 career against the Brewers, had a 2.03 career ERA against Milwaukee entering Tuesday. "A lot of power in that lineup. Really throughout the whole lineup is pretty solid, so the biggest thing you do is try and keep them off balance as much as possible," Miller said. The Cardinals had built a 3-0 lead by the top of the fourth to back Miller. After missing the season’s first 13 games with left knee tendinitis, Ellis made a nice debut by driving in a run in the second on a groundout, and another in the fourth off a sacrifice fly. "Mark did a great job — all the little things we talk about," Matheny said. NOTES: Kolten Wong had started 12 of the team’s first 13 games at second until Ellis rejoined the club. Manager Mike Matheny said he didn’t necessarily have a plan on how he would split playing time. "We just watch how he’s going, watch how Kolten’s going," Matheny said. "Realize that we have a very, very good option there at second base and just kind of take it day by day." … The Cardinals were 8-1 on Tax Day since 2005 entering Tuesday’s game. … Brewers manager Ron Roenicke managed his 500th career game to become the sixth skipper in franchise history to reach that plateau with the organization. … The teams wrap up the three-game set with a Wednesday matinee. The Cardinals’ Joe Kelly (1-0) will be opposed by the Brewers’ Wily Peralta (1-0) on the mound.